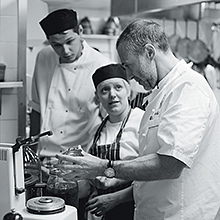 A look at the organisation and a day in the life of Le Gavroche. 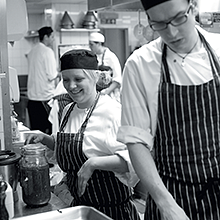 Overall responsibility for food quality, management, hiring & firing of kitchen staff, food costs & menu development. 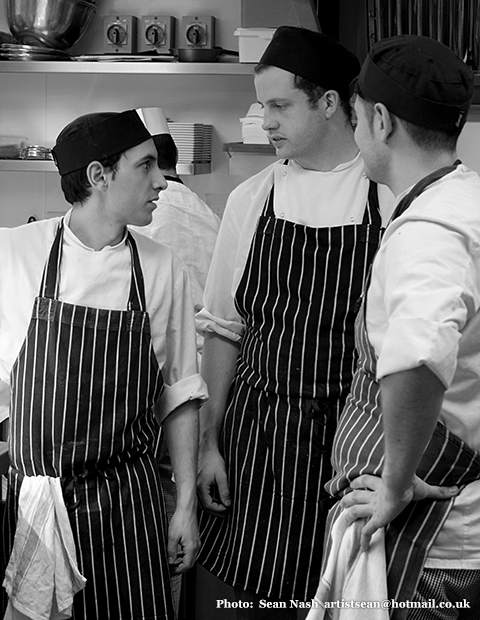 Capable of all duties in the kitchen: link from head chef to the rest of the team. Needs seven years of working & cooking experience. Runs and organises a section (i.e. fish, meat) and responsible for cooking to the standard required for teaching other minor chefs their tasks. Usually needs a minimum of five years working experience. Has the ability to cook at Chef de Partie level, but needs more experience to take on this responsibility. A major step on the ladder. Can be left to cook and present food. Mostly preparation. Nothing cooked or prepared will go unchecked, a work horse. The first step. 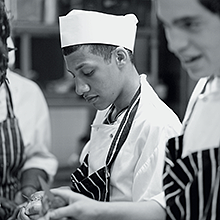 A traditional apprenticeship with a good head chef as a mentor is unbeatable. Two or three years of hard graft - expect the jobs no one wants. Without the porter the kitchen just doesn't run well. Good cooking starts with a clean pan. 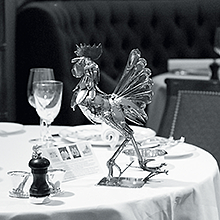 Responsible for all front of house, staff management, health & safety, customer relations, reservations, recruitment. Needs two languages at least. Cover for manager, specific responsibilities given for laundry, cleaning crockery, stocks etc, and for staff rotas. 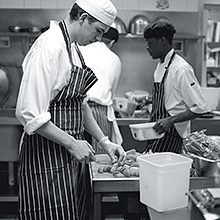 In charge of a 'carré' or a section of the dining room, with two or three more junior staff. Takes orders from customers, capable of carving, controls speed of service. Needs presence and strong character. Can take orders from clients and expected to take responsibility. Has all the skills but needs more customer relations experience to take the next step. Too young to become chef de rang; needs more experience to gain the confidence that will provide assurance to the diners. A lot of polishing, laying tables, cleaning and basic work. Vital that it's done properly. Carries out the important but menial task of delivering trays of food to the right table. Usually not looking at making a career out of waiting. Like the kitchen porter, vitally important. A good one saves you money from fewer breakages and makes sure everything is spotless. For the twenty two kitchen staff, the day's work has just begun. People are chopping, dicing and slicing piles of vegetables into perfect cubes, batons and circles. Michel Jr is on the telephone in his office. 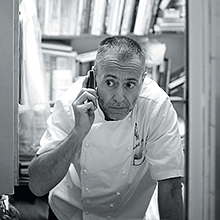 He checks the day's menus, while keeping an accurate tally of the restaurant supplies. His weekly grocery order includes 1,280 eggs, 60 kilos of butter, 200 kilos of potatoes in 5 varieties, 80 lobsters & 500 scallops, not to mention a £4,000 order for fruit & vegetables and 30 loaves of specialty bread. Upstairs the outside steps are scrubbed & swept. Lobby & lounge have been vacuumed & dusted. 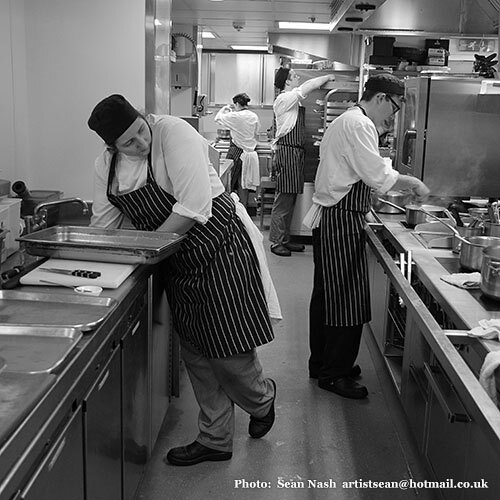 Down in the kitchen, porters briskly scrub the tiled floor. Four more porters begin polishing hundreds of pieces of cutlery. Emmanuel circles the plush green & claret dining room, checking and checking again. He walks from table to table, as the waiters finish laying them. 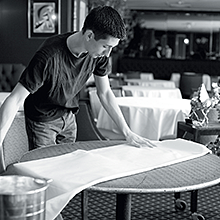 Each starched linen napkin is placed at just the right angle. Each glass is exactly the same distance from its neighbour. Around 11.30 Michel Jr, Emmanuel & the senior staff have lunch. Lunch service is about to begin. The dining room has just been vacuumed again. Michel Jr is back in the kitchen, tasting & checking, always checking. He checks every section, meat, fish, and pastry. All is ready. Michel Jr is back at the pass, ready for lunch. Service begins. The doors from the kitchen into the restaurant swing open every 30 seconds. The dining room is full. The Sommelier helps diners choose wine from 65,000 bottles in the cellar. 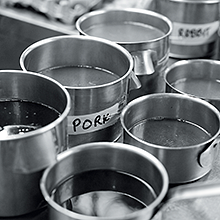 In the kitchen, orders are pegged onto one side of the pass & Michel Jr calls them the minute they come in. He has only one thing on his mind - a perfect plate of food. As plate after plate leaves the pass, Michel is still calling back to his team. In just over a minute, Michel Jr inspects garnishes & sauces for different dishes. In less than two minutes the waiters are placing them on the tables in the restaurant. Nearly all the main courses have been served. Some early arrivals have slipped away, but the restaurant is almost full when Michel goes to meet his diners. 'I'm not a particularly gregarious person' he says back in the kitchen. 'But it is good to show my face and keep in touch with the customers'. While the chefs from the main kitchen are busy scrubbing & cleaning their preparation areas & stoves, the pastry chefs are bringing their dishes to the pass. The restaurant is empty now. The last diner, happily replete, has just walked up the stairs and out into Upper Brook Street. As the receptionist closes the door behind him, the cleaners start again. Michel Jr slips away for a run in Battersea Park, but only after ensuring everything is ready in order for dinner tonight, and the next day's business. 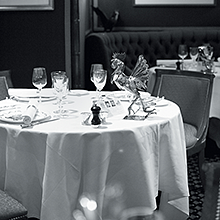 Sshh, for the first & only time in the day, Le Gavroche is quiet. Michel Jr is back from his run. The kitchen is full and busy. The waiters are about to change their uniforms for dinner. They've already eaten. Emmanuel briefs the staff on the evening ahead. The kitchen floor is scrubbed again. Trays of langoustines & scallops are ready for their final poaching. Lobes of foie gras stand waiting to be grilled. The meat chefs have already braised and boned their legs of lamb. Everything is ready. Michel dons a fresh white jacket. The first of the 100 guests start to arrive; with their vintage Taittinger champagne they are served delicious canapés. One by one the silver trays leave the kitchen full and return minutes later empty. 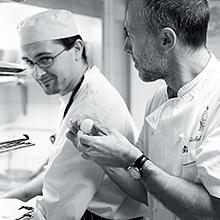 Soon after, Michel takes his place at the pass. His glass of water, his garnishes and sauces are ready. The hum of conversation in the restaurant is clearly audible now. Emmanuel marshals his staff: 'Do as I say. Go when I tell you' No one would dare disobey him. 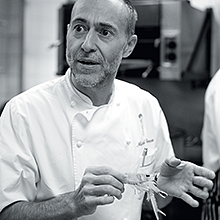 He nods at Michel and the order to start goes back to the kitchen. The courses roll out in orchestrated perfection. The plates return to the kitchen scraped clean. Everyone in the kitchen is working as hard as they can. 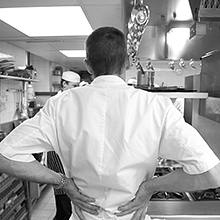 Michel Jr stands up straight for the first time in an hour, and walks around the kitchen, chatting to the staff. Everyone looks pleased and relieved. The pressure, for tonight at least is over. But not, the work. After the cheese course the plates come back scraped clean. 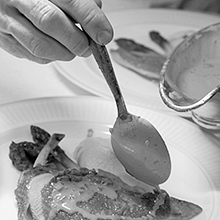 For any cook, even one with two Michelin stars, a plate scraped clean is the best compliment of all. He goes into the restaurant and the applause from the diners rings through to the back of the kitchen. He is tired, apart from a small break; he has been working for more than 13 hrs! The desserts are plated up and are ready to be served. 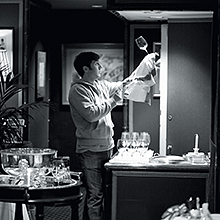 The waiters stand by, to prepare coffees & tisanes, and serve the petit fours. After final inspection Michel Jr's work is over for the night. One hundred people have enjoyed what is probably the culinary experience of their lives. 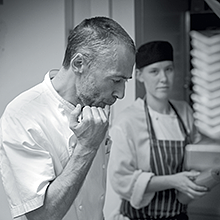 For Le Gavroche and its staff, it is the end of just another day. Applicants do not require previous experience but must demonstrate drive and a passion for the industry.